Since 1997 Sifu Alexander Olich is training now for two decades under the guidance of his SiFu: Grand Master Prof. Dr. Keith R. Kernspecht – one of the greatest Martial Artist of our Century and a disciple of Bruce Lee’s strongest student, Jesse Glover, as well as the disciple of Bruce Lee’s own teacher’s closed-door student – GM Leung Ting. SiFu Alexander Olich’s devotion to Eastern Asian philosophies – Chan Buddhism, Daoism and Confucianism brought the wish to develop academically in that direction. So, after graduating from high- school he studied Asian-Pacific Business Administration in Cologne, Germany, with Special focus on China, Japan & Korea. For 4 years, he studied Chinese language, Easter Asian Culture, Politics & Economy which also led him to a 6-month studying time in Shanghai, PR China. SiFu Alexander manages the organization in Cyprus with currently 3 schools (Limassol & Nicosia) with hundreds of students. He is a private student of Grandmaster Kernspecht, Grandmaster Oliver Koenig, Grandmaster Giuseppe Schembri and Grandmaster Thomas Schroen as well as Escrima Master Thomas Dietrich. In 2012 he was appointed Chief-instructor and Representative of the Cyprus WingTsun & Escrima Organisation (EWTO CY) and in 2017 Chief-Instructor and Representative of EWTO SERBIA by his SiFu – Grandmaster Keith R. Kernspecht (European Chief Instructor). Given his background in practical self-defence as well as Economy he is giving seminars in the popular topics such as Assertiveness at Work & at Home, Teambuilding in Companies, Violence Prevention for Children, Women Self-Defence, Fright- Reactions & how to deal with fear, etc. His knowledge and skills are in high demand and he frequently holds Seminars in Cyprus and as guest Instructor overseas. Sifu Alexander Olich has direct authorisation by Grandmaster Kernspecht to act as Chief Instructor and Representative of the European WingTsun Organization (EWTO) in Cyprus. He alone is responsible for establishing and directing the organiztion and is in charge of instructing and testing all WingTsun instructors in CYPRUS. 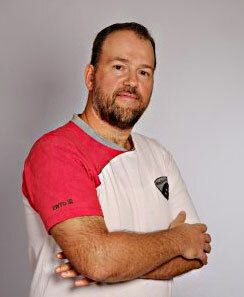 He also claims responsibility for the distribution of geographical rights to open an EWTO school in CYPRUS. SiFu Alexander and his team are fluent in six languages (Greek, Turkish, English, Russian, German and Serbian) which enables them to teach different people from different nationalities as well as to follow all updates within the EWTO around Europe. SiFu Alexander Olich introduced EWTO WingTsun in Cyprus and is wholeheartedly committed in sharing his knowledge and skills with the Cypriot society.